Millennium 7 Publishing Co.: Best Practices For Live Social Media? Best Practices For Live Social Media? Social media has successfully allowed users to experience moments in real time with the live feature on platforms such as Facebook, Twitter (Periscope) and Instagram.. Success with live goes beyond having a smartphone and a good internet connection. Going live on a personal account is certainly much different from going live on a brand page. On your personal account, your goal is most likely to make your friends laugh. As a brand, your goal is to stay ahead of the competition and represent a company that is successful, innovative and creative. Below are some live best practices from the brand perspective. If you are your company’s social media guru, you most likely monitor your social media audience and current trends. Part of being successful on social media is knowing what your followers want to see. Find the content that resonates with your followers and bring it to life. Don’t jump in and start your live video without giving your followers a heads up. They need to know when your broadcast will start so they can make sure to tune in. And, most importantly, let them know what your broadcast will be about. It will give your followers something to look forward to -- and better yet, the opportunity to share it with their friends if it’s something they might be interested in. Develop a promotional graphic or video that your followers will find engaging. Add the following elements to your promotional content: topic or event name, persons featured, date and time. If you intend to share your graphic across all of your social media channels, modify it to meet the spec requirements of each platform. Meet with your stakeholders beforehand and prep them for the video because some people are camera shy. Reassure them that your social media followers are not looking for a perfect video, but rather an interesting one. If you’re doing a Q&A-style live video, review the questions and let them practice their responses. They will most likely realize how comfortable they will become when they start talking about a passionate subject. Most importantly, show them the simple camera you will use to record the video, such as your smartphone. Bright lights and large cameras can be intimidating. Related Article: 7 Powerful Video Marketing Tips? You’re ready to get that livestream started, but before you do so, make sure your internet connection is strong so that there are no delays or interruptions during the broadcast. You can do a test run using your personal account. You want your followers to be able to hear your video clearly and not have to turn the volume on their device all the way up. Use a lavalier microphone to ensure quality sound if you have people speaking directly into the camera. If you are recording an event, use a shotgun microphone. 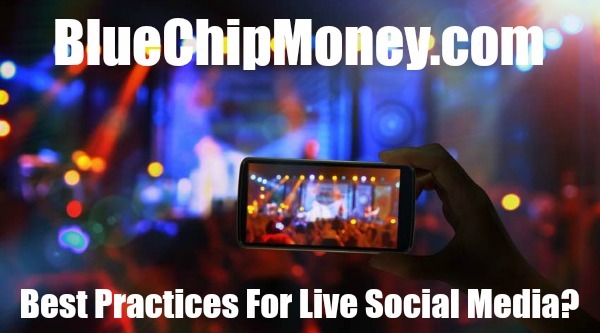 You have pre-promoted your live video, checked your internet connection and sound, and rehearsed beforehand -- you are now ready to go live. There might be a bit of anxiety that will come with the idea of going live, especially if it is your first time. But once the video starts recording and you begin to watch the number of viewers increase, a sense of relief comes over you. I still get a bit nervous before I record a live video, and I've gone live more than a dozen times. The most important tip of all: Make sure to have fun with live recording. It is the perfect opportunity to show off your brand in and out of social media. Celebrate the great work taking place at your company while also highlighting your company's social media trending tactics. Guest Authored By Chloe Politis. Chloe is Associate Director at Mount Sinai Health Systems, overseeing digital and social media strategy. Follow Chloe on Twitter. Related Article: 127 Facts About Video Marketing? Make sure to have fun with live recording. It is the perfect opportunity to show off your brand in and out of social media. Celebrate the great work taking place at your company while also highlighting your company's social media trending tactics.."